BRUJA WAR -- xigonas in the pit xingonas on the turn tables and CDJS xingonas on the mic. 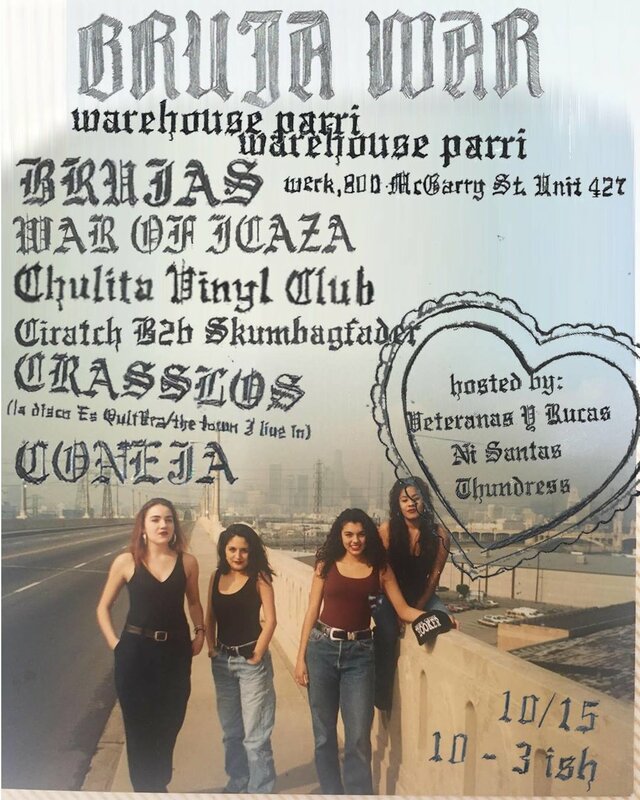 coming all the way from the east coast BRUJAS -- feminist revolutionaries who skate and do other radical stuff are screaming death to all male lineups on their 3 date tour with War of Icaza. Hood to Hood ! Looking forward to our time in LA, the homeland for much of the political ideology that has inspired our radical minds. Space is located on the fourth floor of the main pink building of the Alameda Towers with the purple neon Market District sign on top. Enter through lot on Alameda between 8th and Olympic. $3 to park in the lot or free street parking on Alameda between 8th and Bay St.